Put a Valentine Patch On It! Time to get out that red yarn and crochet (and knit) away! I love crocheting hearts for Valentine’s Day and made this crochet heart a couple of years ago. 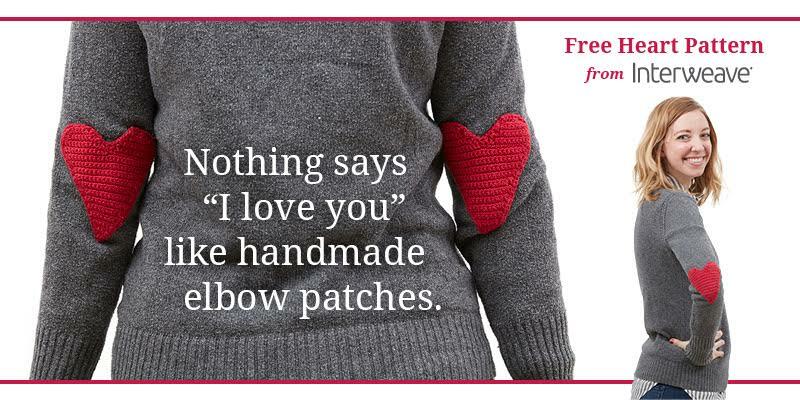 I’m looking forward to sharing this Valentine patch with you – but of course, it doesn’t have to be a patch! To be sure all of our crafty fans have the opportunity to decorate, Hannah made a knit version for all you knitters out there! You can vary the size, color, and texture so you’ve got hearts for all occasions. Simply choose larger or smaller hooks/needles as you change yarn weight. For instance, I made two out of size 3 crochet thread and sewed them onto a sweater as elbow patches. 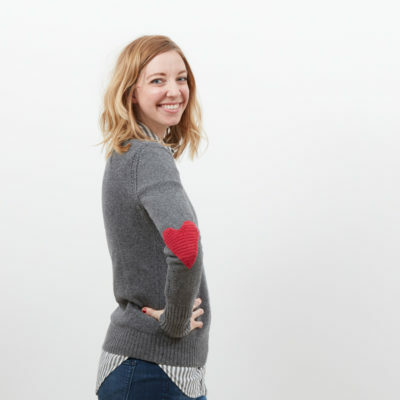 Make a heart-shaped pocket for a sweater or T-shirt, leaving the heart’s top open when sewing. Create a heart with worsted weight yarn, then attach it to the center front of a top, or wear your heart on your sleeve. Make a tiny crochet heart, then pin onto a card for your sweetie. Spray handmade hearts with starch to stiffen it up and attach to earring wires or a necklace. The possibilities are endless, so get creative! Yarn Size 3 crochet thread: Any festive color, 1 ball. Hook Size E/4 (3.5mm) hook. Notions Old sweater or cardigan; sewing needle and coordinating sewing thread; pins. Gauge Gauge is not important for this project. Notes When deciding which sweater or cardigan to use, choose one with a simple design. Heart is worked from bottom point to middle, then one heart hump at a time. Row 1: Sc in 2nd ch from hook, turn—1 sc. Row 2: Ch 1, 3 sc in sc, turn—3 sc. Row 3: Ch 1, sc across, turn—3 sc. Row 4: Ch 1, 2 sc in first sc, sc in next sc, 2 sc in last sc, turn—5 sc. Row 5: Ch 1, sc across, turn—5 sc. Row 6: Ch 1, 2 sc in first sc, sc across to last st, 2 sc in last sc, turn—7 sc. Row 7: Ch 1, sc across, turn. Rows 8–24: Rep Rows 6–7 eight times, then rep Row 6 once more—25 sc at end of last row. Do not fasten off. Row 1: Ch 1, sc in next 12 sts, leave rem sts unworked, turn—12 sc. Row 2: Ch 1, sc2tog, sc across, turn—11 sc. Row 3: Ch 1, sc in next 9 sts, sc2tog, turn—10 sc. Row 4: Ch 1, sc across, turn. Row 5: Ch 1, sc2tog, sc in next 6 sts, sc2tog, turn—8 sc. Row 7: Ch 1, sc2tog, sc in next 4 sts, sc2tog, turn—6 sc. Fasten off. Row 1: Sl st in 2nd unworked st to join, sc in same st as join and in each rem st across, turn—12 sc. Rows 2–7: Rep Rows 2–7 of first hump. Do not fasten off at end of last row. 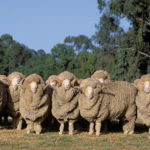 Working in ends of rows, sc around hump and down side of body to point, 3 sc in point, working in ends of rows, sc up side of body and around hump to 2nd to last row-end before valley, sc3tog in (next row-end, unworked sc and next row-end), sc in each row-end to top of hump, sl st in first sc to join. 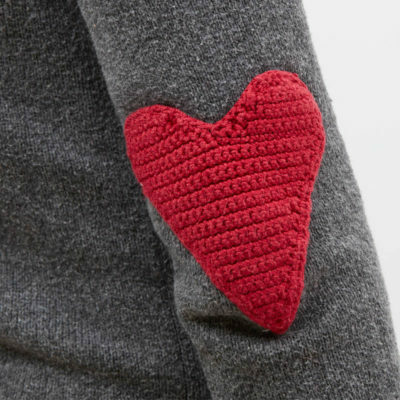 Pin one heart to each elbow of your sweater. Try it on (being careful of the pins) to be sure the hearts cover your elbow. When you like the placement, sew in place. Row 4: k1f&b, k to 2 st to end, k1f&b, k1. Repeat Rows 1–4 until there are 21 sts, ending with Row 4. Next row (RS): k9, k2tog, turn. Next row (WS): sl1, bo1, knit to end. Next row: bo1, knit to end. Rep last two rows until there are 5 sts left. BO row. Next row (RS): With RS facing, attach working yarn, bo1, knit to end. Next row (WS): Bo1, knit to end. If you are looking for more crochet projects that inspire love, try out Interweave Crochet Summer 2015. The issue is packed full of cute crochet hearts, flowers to make a bouquet, wrist corsages, boutonnieres, and bowties—all the trimmings for a truly romantic evening. These projects are fun and small and perfect for a knitter ready to try some crochet! Happy stitching! Happy Valentine’s Day!